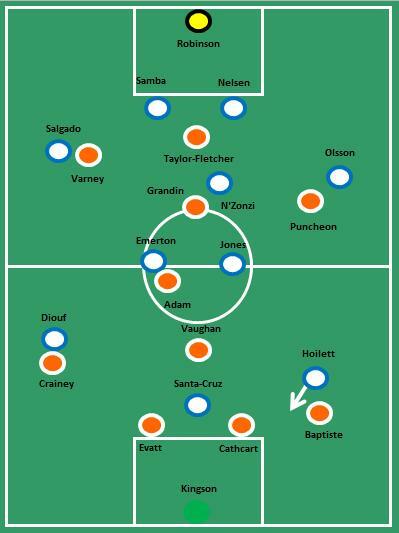 Blackpool have attacked this season and it’s easy to look at the drive and incisive passing of Charlie Adam or the goals of DJ Campbell as explanations behind that. However, Blackpool’s attacking is more sophisticated than to rely on two players and it is far removed from the Tony Pulis description of roulette football. Only when things fail can you gain an understanding of why they work so well. The purpose of this post is to illustrate the point that Holloway made. The focus of the post will be the role of Kornilenko and is by no way a criticism of him. Holloway admits the mistake himself and that Kornilenko and Beattie are both new to the Blackpool system and by the evidence of this game are still learning. The period of focus here is the first 20 minutes of the game and in that period Kornilenko made 7 passes and 4 of them found the opposition. As he became involved in play it is easy to see why he had to come off. Take his involvement in the 4th minute. As the ball was played forward he drifted inside to a central position. You can see from the picture below he has drifted inside and offers Blackpool no width. The zone you can see is exactly where he should be taking up his position. The tangerine zone highlighted is where Korni should be. The white dot indicates the location of the ball. Almost straight after his first positional error it crops up again. In the 5th minute he takes up a wide position upon receipt of the ball, again though, his instincts mean he doesn’t make the right movement. As illustrated below, he should follow the line to exploit the space. Much better position for Korni, he must move along that line to help Blackpool's system function. As he lays the ball off he then makes the move inside taking away the forward width that helps to stretch the opposition defence, as he goes inside he offers no passing option and the move breaks down. You can see where he moved to below, right beside DJ Campbell in the centre forward position. He's there again, the man with the centre in his eye. Once Kornilenko realises that he’s drifting inside he starts holding a wider position across the width of the pitch, however, his position has another reference point, the length of the pitch. 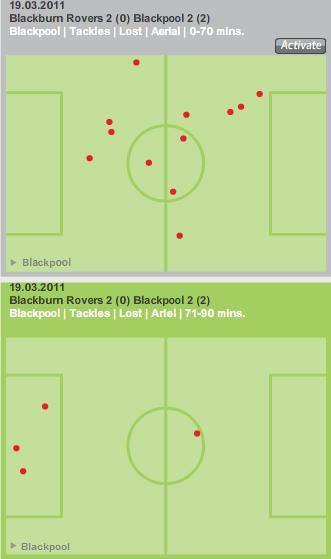 Below you can see he is almost in a winger position and not the forward position that Blackpool’s system needs. DJ Campbell is too far away for a link up and Kornilenko ends up hitting a hopeful long ball to the opposition. Both Southern and Vaughan are ahead of him at this point and this shows the overall impact of getting the forward play wrong. It might seem insignificant, but it impacts the whole team from front to back. Korni is in a wing position and two midfielders (white) advance ahead of Korni where they should support him in an advanced position. By the 13th minute Kornilenko takes up good wide position off the ball, when the ball eventually breaks, he is able to support the attack and set up Eardley to deliver a (poor) cross in to the box. At this stage Holloway’s pitch side communication must be working, the positioning is getting better and supporting the team’s play as a consequence. The forwards highlighted are spaced better and at the top Korni is where he should be. Finally. On the quarter game mark, again the forwards start in good positions (below) and you can see how, as the midfield breaks Blackpool’s 4-3-3 becomes apparent. 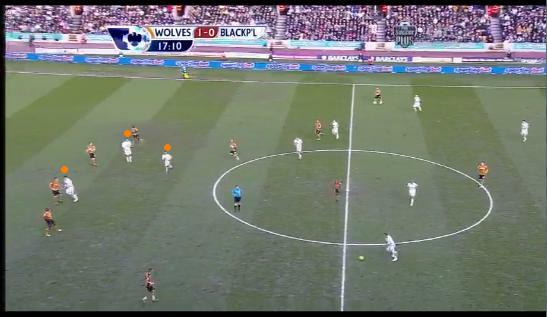 Earlier in the game the poor forward positioning meant that Blackpool’s formation was poor and Wolves exploited this. Here, the ball moves across to Kornilenko at the top of the picture, however, his instinct as a central striker dominant and he stops to hold up the ball with his back to goal, he becomes isolated and ends up playing a hopeful ball similar to the one played in the 7th minute. Starting position is good. Move comes to nothing. As the game progresses in to the 18th minute, Kornilenko’s instincts are way too dominant, not only as seen in the previous move where he held the ball up, by this time the forward line has lost any shape it had, and Blackpool end up in a mess. The forwards starting positions have been lost. This isn’t necessarily bad. 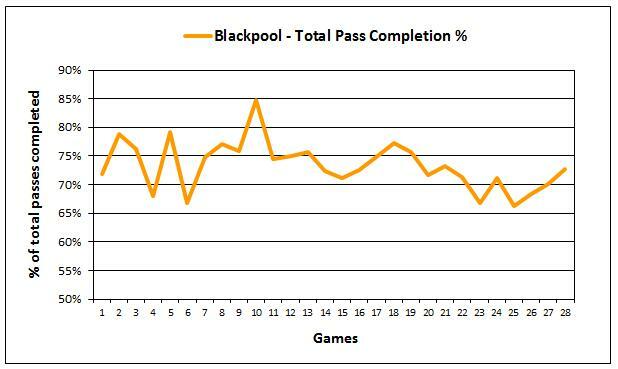 A feature of Blackpool’s forward play is the movement. From here the forward could cross run in to the flanks and get behind the defence or even make direct lateral runs to the wings. The problem here is the both Beattie and Kornilenko want to play through the middle and neither is supposed to be there. The central striker in the formation at this stage of the game was DJ Campbell, who as you will see below drops deep to receive the ball. This is a common move for Campbell; usually he can drop deep, receive the ball, give it and make a run through the central area. In this instance he is obstructed by his fellow forwards, the move breaks down and so does Holloway’s patience. 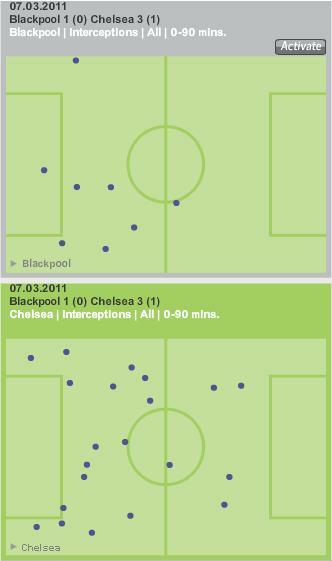 The picture below demonstrates perfectly why the poor movement up front bring’s Blackpool’s system to a halt. The system is attacking, all the players want to push forward and the forward set the tone. If they move and occupy the flanks the team can structure themselves around them and inter play with them. However, Kornilenko goes and clusters the centre and it makes it easy for Wolves to defend. Beattie and Korni want to stay in the centre and renders Blackpool's forward line static. Holloway knew he made mistakes here and two recent additions to the Blackpool squad show that it’s far from easy to adapt to his system and three forwards can be a crowd. 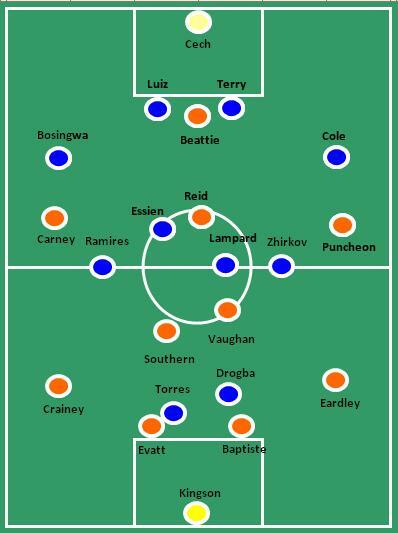 Blackpool went in to their next game versus Chelsea with DJ Campbell suspended and fielded a lone striker in Beattie. Perhaps this shows where Holloway will look to focus and as the 4-3-3 comes out again Blackburn next week perhaps the key selection dilemma will centre on the other forwards. Will Kornilenko have learnt the role over by then or will players such as Luke Varney and Gary Taylor-Fletcher come back in as tried as tested components of the system that has worked so well this season and last? Or will Kornilenko prove to be the man for the central role? The Improbable Dream? Part One. 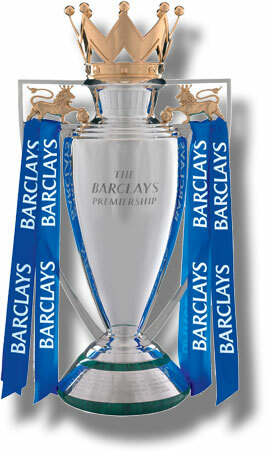 Not a chance of lifting this, but oh to be a part of it all again next season! Back in December this blog put together ten ways for Blackpool to stay in the Barclays Premier League. With ten games of the season remaining it is time to look back at those ten ways to see how Blackpool measure up against them and what that might mean for their quest towards the improbable dream. The original article picked out the aforementioned ten ways by highlighting the things that had given Blackpool a good start to the season ranging from their attacking approach to the lack of consideration by other teams to the way that Blackpool approach the game. After running through each aspect it appears that Blackpool are still doing a lot of the right things even though their recent form has been poor. Since the article was written, Blackpool has played a total of thirteen games and it’s these games that will be scrutinised in order to give us a progress report. A quick glance at those games shows that Blackpool; won four, drew one and lost eight. Their previous fifteen games (prior to the last article) saw them win five, draw four and lose six. Should Blackpool not lose any of their next two games then their records in the two halves of the thirty games played this season will look remarkably similar and belie any suggestions that Blackpool are slipping to relegation. 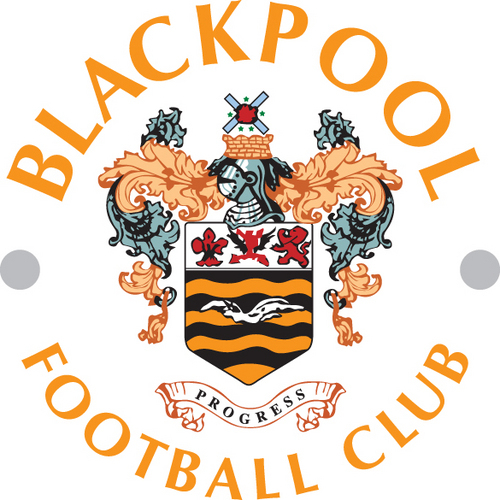 When looking at the ten ways, it appears that Blackpool are still successfully plodding their way through six of them and this helps to account for the positive results of the last thirteen games, whilst the negative aspects of Blackpool recent play can be largely catered for with the other four. 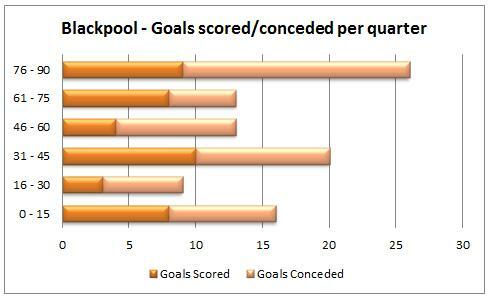 Anyone who has seen Blackpool this year will testify to their attacking commitment and this has certainly not dwindled. From attacking for the (never to be) fourth goal at Goodison Park against Everton, to the pressing Manchester United up against the wall for 60 minutes and robbing them of two goals. In fact, in the last thirteen games Blackpool have scored at a rate of 1.46 goals a game which is only marginally down on their 1.53 goals from the previous fifteen games. 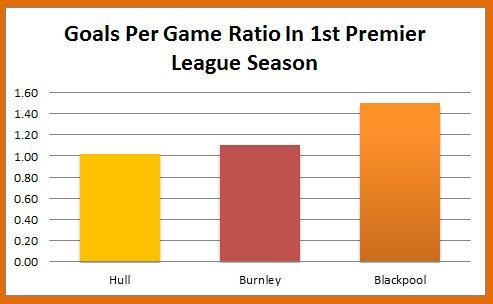 See below for a comparison against Blackpool’s oft favoured comparators Hull and Burnley and see how their goal scoring compared in their inaugural Premier League campaigns. Feast or famine. 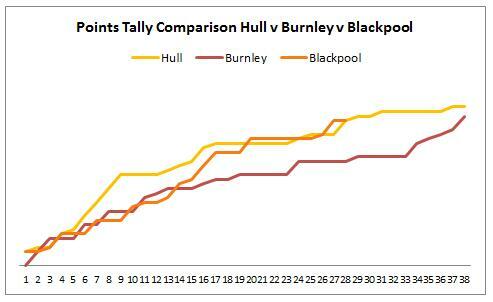 Hull and Burnley starved whilst Blackpool have been feasting quite well all season long. Part of what Ian Holloway has brought to the Premier League with his Blackpool side is his tried and tested 4-3-3. He hasn’t swayed much from this formation and hasn’t tried to drop more numbers in to defence or midfield to close out the space. In fact only when protecting leads (most notably versus Liverpool & Everton) and against Spurs from the start of the match has this been adjusted. In the main it works for his players and if it ain’t broke, don’t fix it. These are still an active piece of Blackpool’s approach, if a little over used, they still help to stretch the play and set up attacks for Blackpool and help in unsettling the opposition. 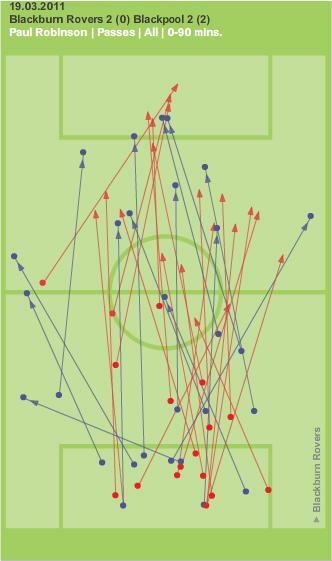 However, if anything they can be over played and lead to Blackpool’s heading up the list of long balls played as detailed recently in the BBC tactics blog. If you want to read more about these then Up The Pool covered them and their impact in vast detail. It was speculated earlier in the season that should DJ Campbell get the ball at his feet in the space between penalty spot and goal line then he will start scoring. In the first fifteen games of the season Campbell had netted twice and endured a couple of hardworking if fruitless games, the match against Bolton springs to mind. However, since then he has amassed 7 goals in the last 13 games to vastly exceed all expectations of him. At this rate he might get close to 13 goals this season which would have a huge impact on Blackpool’s attempts at staying up. 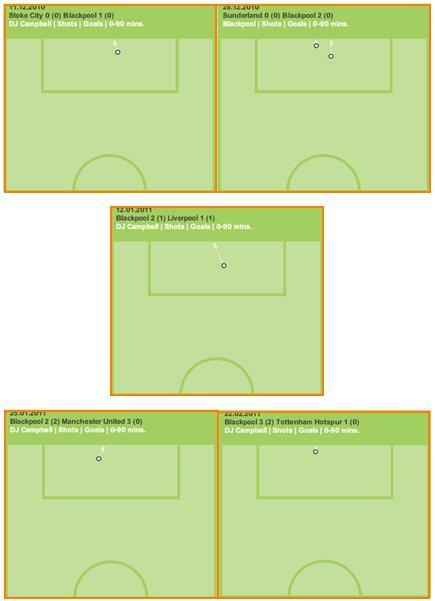 See below for the Chalkboards from the goals that he’s scored in the last thirteen games and if you read the original article, note how all of them are in his favoured zone (but arguably any striker’s favourite zone). As all strikers would aim for, finishing their chances when getting sniff of the goal from close range. One aspect that many Blackpool fans were concerned with earlier in the season centred on ‘being found out’ that teams will know how to play against us and counter it. In the earlier part of the season, teams who played with a holding midfielder generally had greater success against Blackpool whilst Birmingham were the only team to make match specific changes to their approach to counter Blackpool. In the last thirteen games it could be said that Birmingham are still the only team to actively counter Blackpool by changing their shape as they brought their diamond from the St Andrews game to Bloomfield Road and secure the three points. One thing this has meant is that Ian Holloway has still not had a reason to come up with a Plan B, he can continue instilling his tactics in to his side without having to vary too much and potentially distort the qualities of his side. This post has now ascertained that out of those original ten ways, six of them are still pertinent. This might have led to quite a dry post, however, in the second part as the negative aspects of recent performances come to light then this should lead to a few interesting insights. Check back on the blog in the next couple of days to read the second and final part of this post.